When do you start sending out your Christmas and Holiday cards? Each year I leave it for the very last minute and end up sending out "Happy New Year" notes instead. To help me get an earlier start, I invited some of my cousins over so we could spend an afternoon writing Christmas cards and creating new memories. Now that we're adults getting together doesn't happen as often. To prepare for our card-writing afternoon, I stopped by Duane Reade near Bryant Park here in New York City. I almost started heading towards the Greeting Cards aisle before I noticed an entire Papyrusstation just a few steps in. There was an elaborate collection of elegant individual cards. For our gathering of 14 women, I chose to pick up a few boxes instead. Each box comes with at least 14 cards making it easier for our group to send out various notes to family and friends. Look at the details on the angel card above. How gorgeous is that?! To be honest, I was surprised to learn that we can now buy Papyrus products at Duane Reade. I've shopped at the Papyrus store in SoHo and love that I can also pick up these beautiful cards at any Duane Reade. It makes it super convenient. To make our afternoon more festive, I added a shimmery, red table runner to my dining table. I offered wine, sparkling water, the holiday cards and pens and we all got to writing while listening to classic Christmas songs. It was the perfect way to spend a cozy afternoon in Manhattan. When shopping for greeting cards this time of year I look for a mix that say "Merry Christmas" and "Happy Holidays" to respect everyone's respective beliefs. I'm sending cards out to family, friends and colleagues and handing some to the doormen/women and porter in my building. This blue "Happy Holidays" card with singing snowmen will be perfect for handing out holiday tips. The cards are smaller and contain a generic message. One of my favorites from the cards I purchased was this "Christmas tree." I like the bedazzled gems with a touch of bright blue, gold and reds. Another favorite is this white and gold ornament. The bow, faux pearls and gold shimmer give it a chic and elegant touch. So classy, right?! These were my favorites. I recommend you stop by your local Duane Reade to see the entire collection and pick up the one you like best. Tell me, when do you send out your holiday cards? I was asked by Carusele to participate in the #PapyrusAtDuaneReade, sponsored by Walgreens. Although I have been compensated, all opinions are my own. To prepare for our card-writing afternoon, I stopped by Duane Reade near Bryant Park here in New York City. I almost started heading towards the greeting cards aisle before I noticed an entire Papyrus station just a few steps in the door. There was an elaborate collection of elegant individual cards. For our gathering of 14 women, I chose to pick up a few boxes of Papyrus holiday greeting cards instead. Each box comes with at least 14 cards making it easier for our group to send out various notes to family and friends. 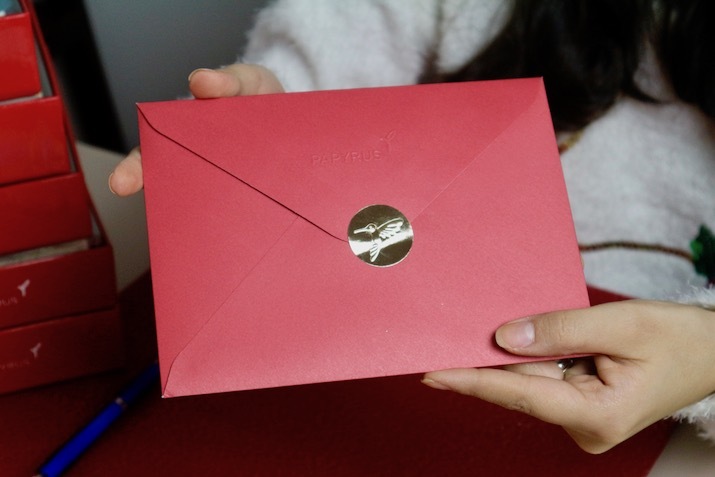 Papyrus Cards are known for their attention to detail and are the perfect paper good to send during the holidays. Look at the details on the angel card above. How gorgeous is that?! Being able to buy Papyrus products at Duane Reade is super convenient, especially during the holidays. To make our afternoon more festive, I added a shimmery, red table runner to my dining table. I offered wine, sparkling water, the Papyrus holiday cards and pens and we all got to writing while listening to classic Christmas songs. It was the perfect way to spend a cozy afternoon in Manhattan. This blue "Happy Holidays" card with singing snowmen will be perfect for handing out holiday tips. The cards are smaller and contain a non-denominational holiday message. Papyrus cards elevate everyday moments, making them joyful events. One of my favorites from the cards I purchased was the one with the "Christmas tree." I like the bedazzled gems with a touch of bright blue, gold and reds. These were my favorites. I recommend you stop by your local Duane Reade to see the entire collection and pick up the ones you like best.